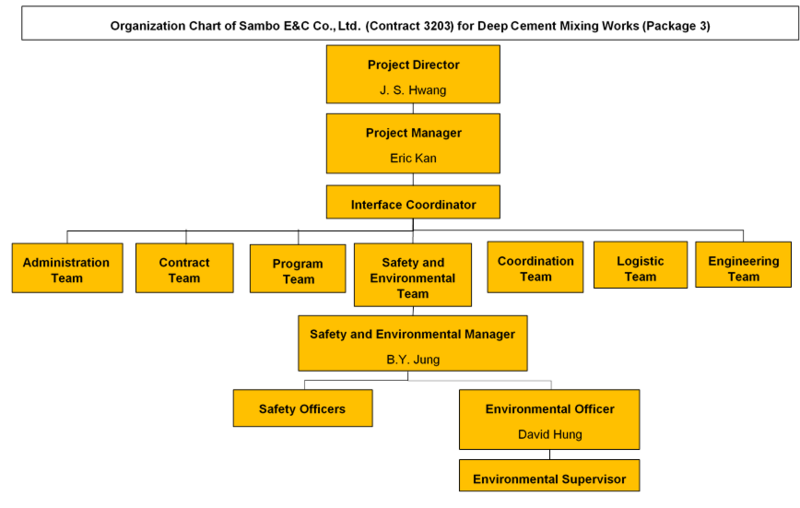 d) organization charts, names of responsible persons and their contact details. 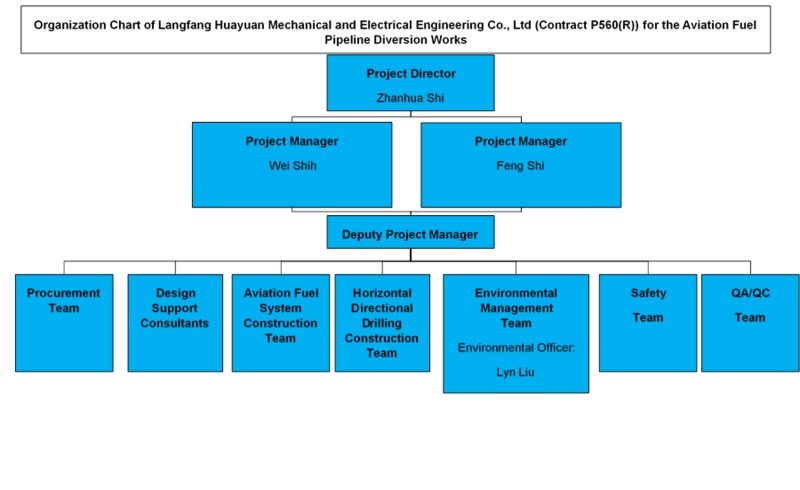 Langfang Huayuan Mechanical and Electrical Engineering Co., Ltd. (Contract P560(R)) is the contractor appointed to undertake the diversion of the existing submarine aviation fuel pipelines. Names of the responsible persons and their contact details are set out in Table 1 below. 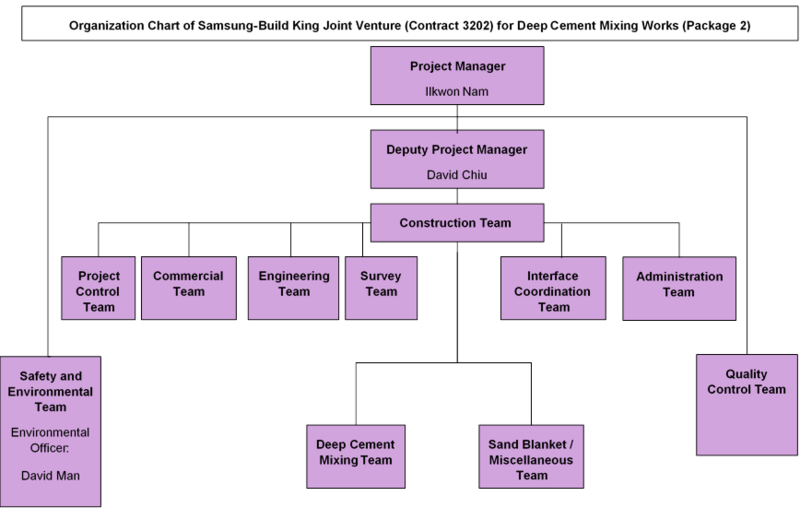 Penta-Ocean-China State-Dong-Ah Joint Venture (Contract 3201), Samsung-Build King Joint Venture (Contract 3202), Sambo E&C Co., Ltd. (Contract 3203), China Road and Bridge-Sambo Joint Venture (Contract 3204) and Bachy Soletanche-Sambo Joint Venture (Contract 3205) are the contractors appointed to undertake the DCM ground improvement works. Names of the responsible persons and their contact details are set out in Table 1 below. 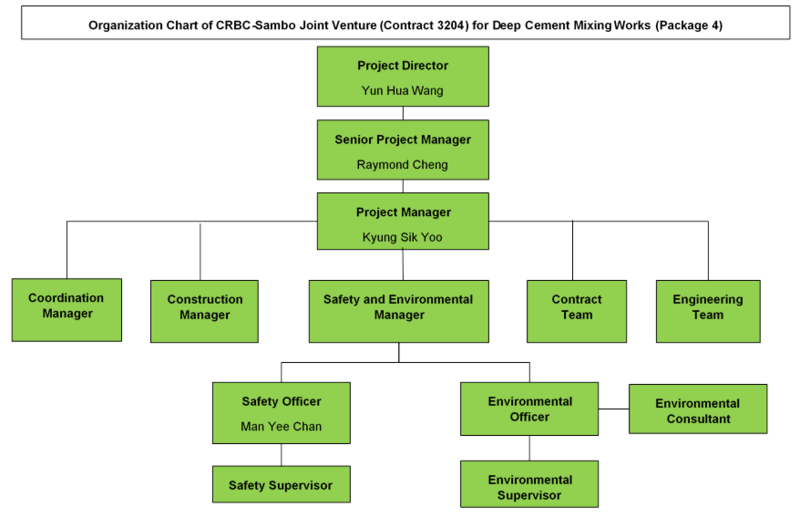 Zhen Hua Engineering Company Ltd.-China Communications Construction Company Ltd.-CCCC Dredging (Group) Company Ltd. (ZHEC-CCCC-CDC) Joint Venture (Contract 3206) is the contractor appointed to undertake the main reclamation works. Names of the responsible persons and their contact details are set out in Table 1 below. 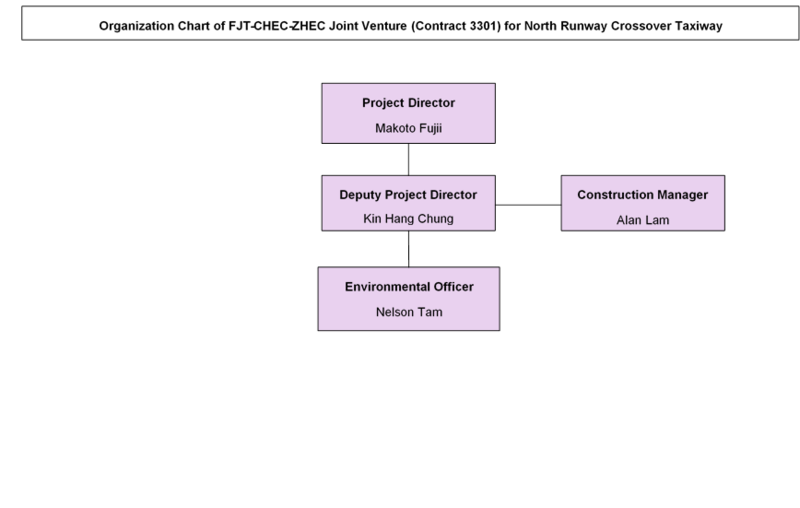 Fujita Corporation-China Harbour Engineering Company Ltd.-Zhen Hua Engineering Company Ltd. (FJT-CHEC-ZHEC) Joint Venture (Contract 3301) is the contractor appointed to undertake the construction works for the north runway crossover taxiway. 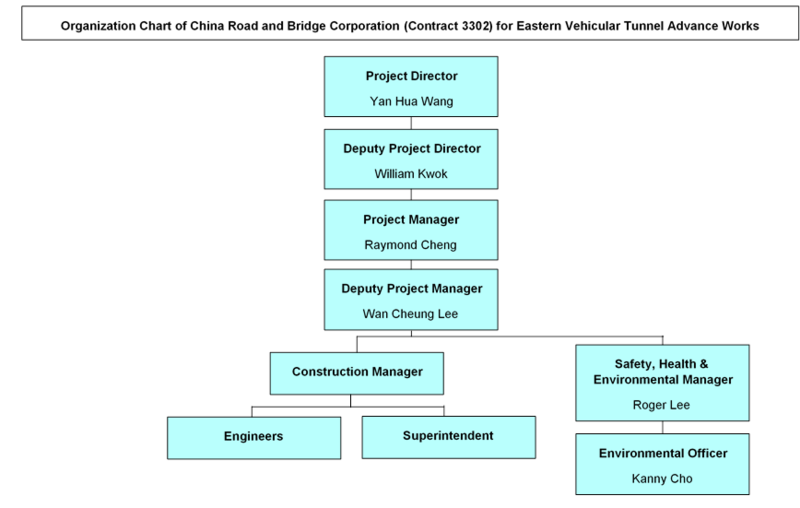 China Road and Bridge Corporation (Contract 3302) is the contractor appointed to undertake advance works for the eastern vehicular tunnel. Names of the responsible persons and their contact details are set out in Table 1 below. 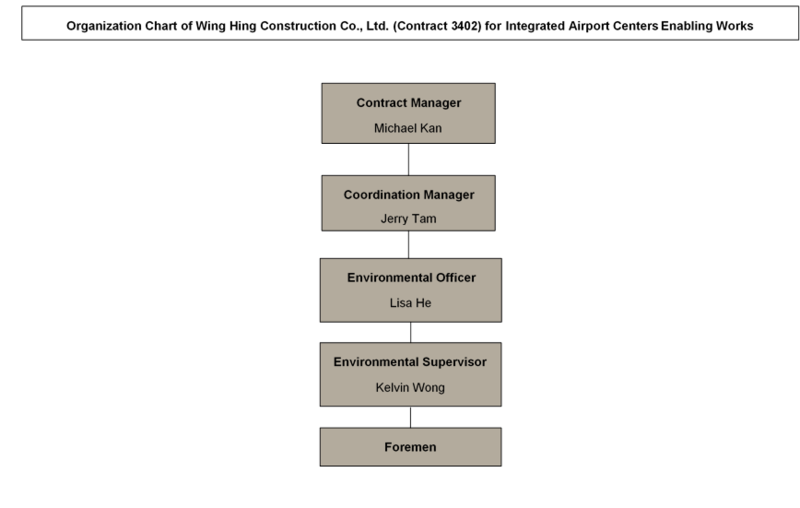 Wing Hing Construction Co., Ltd. (Contract 3402) is the contractor appointed to undertake enabling works for the new Integrated Airport Centres. Names of the responsible persons and their contact details are set out in Table 1 below. 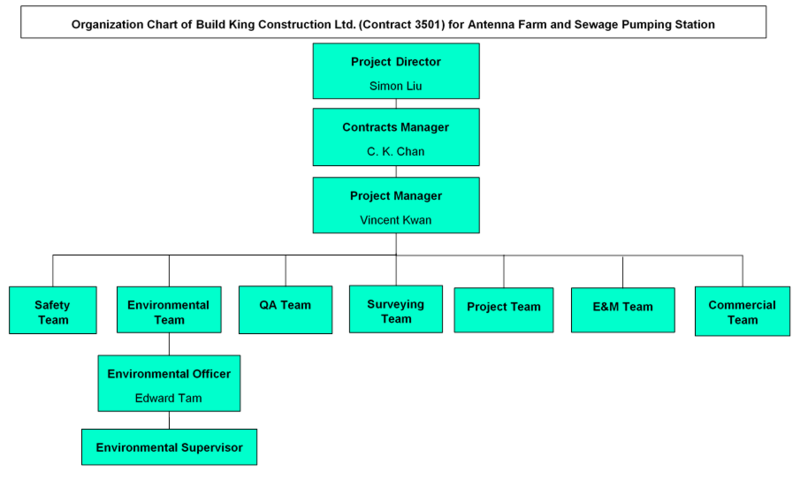 Build King Construction Ltd. (Contract 3501) is the contractor appointed to undertake the construction works for antenna farm and sewage pumping station. 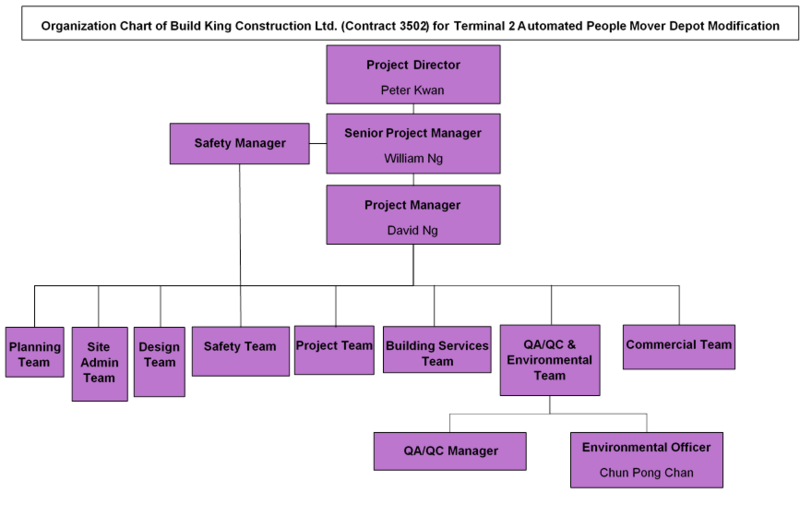 Build King Construction Ltd. (Contract 3502) is the contractor appointed to undertake Terminal 2 (T2) automated people mover (APM) depot modification works. 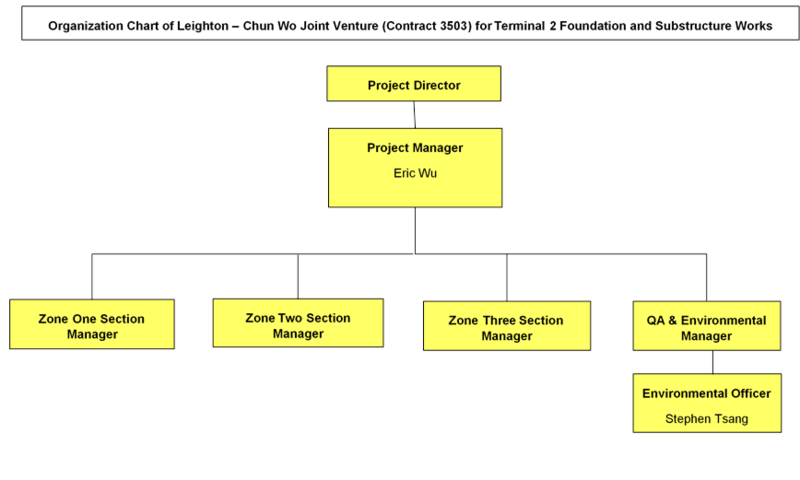 Leighton–Chun Wo Joint Venture (Contract 3503) is the contractor appointed to undertake T2 foundation and substructure works. Names of the responsible persons and their contact details are set out in Table 1 below. 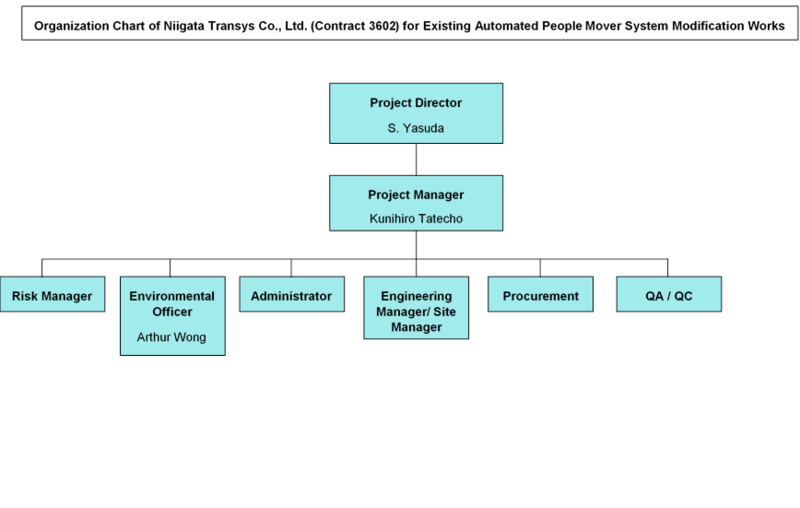 Niigata Transys Company Ltd. (Contract 3602) is the contractor appointed to undertake the existing APM system modification works. Names of the responsible persons and their contact details are set out in Table 1 below. 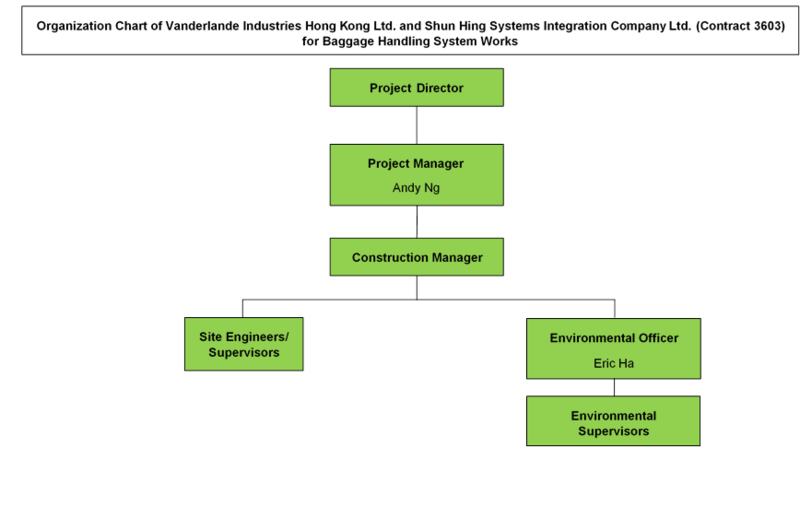 Vanderlande Industries Hong Kong Limited and Shun Hing Systems Integration Company Limited (Contract 3603) is the contractor appointed to undertake the construction works of baggage handling system (BHS). Names of the responsible persons and their contact details are set out in Table 1 below. 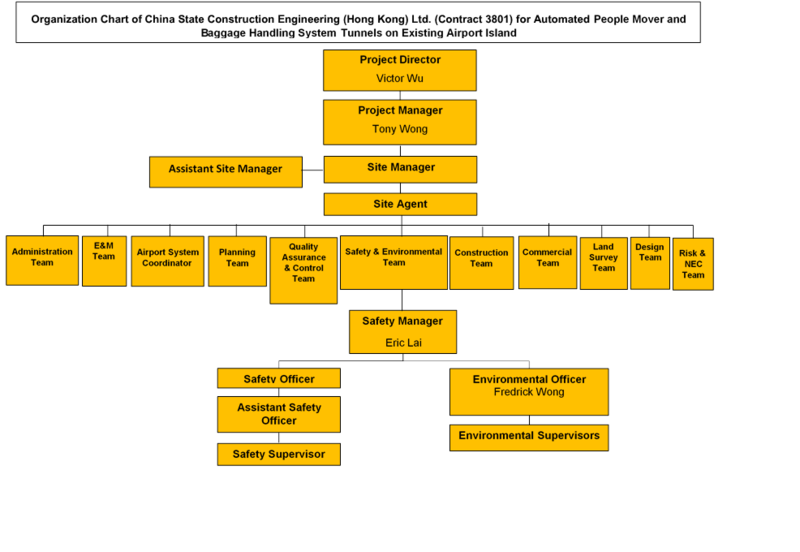 China State Construction Engineering (Hong Kong) Ltd. (Contract 3801) is the contractor appointed to undertake the construction works of APM and BHS tunnels on existing airport island. 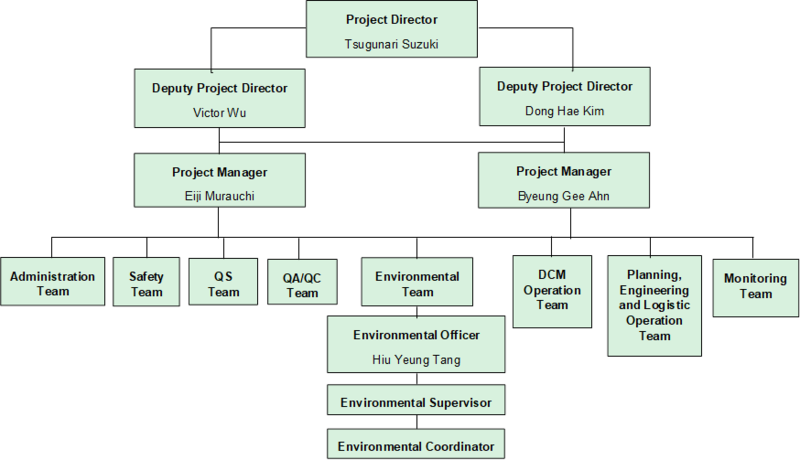 Names of the responsible persons and their contact details are set out in Table 1 below. 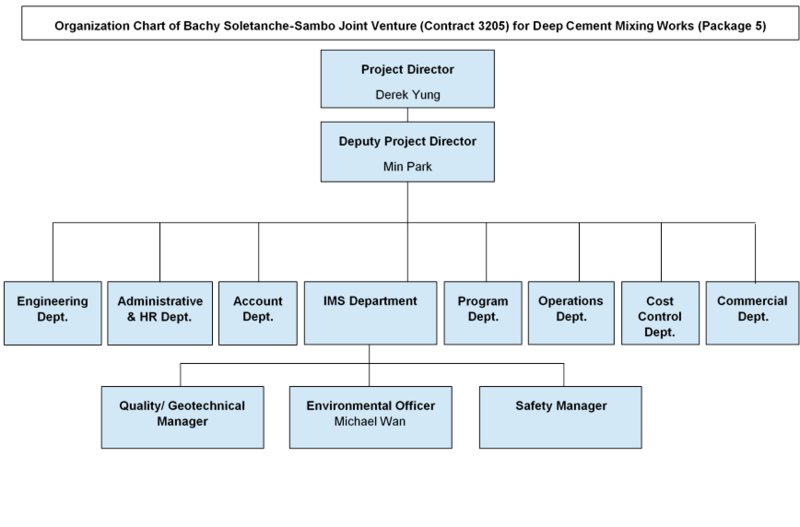 Attachment I presents the organization charts of all the above-mentioned contractors required under EP Condition 2.4. 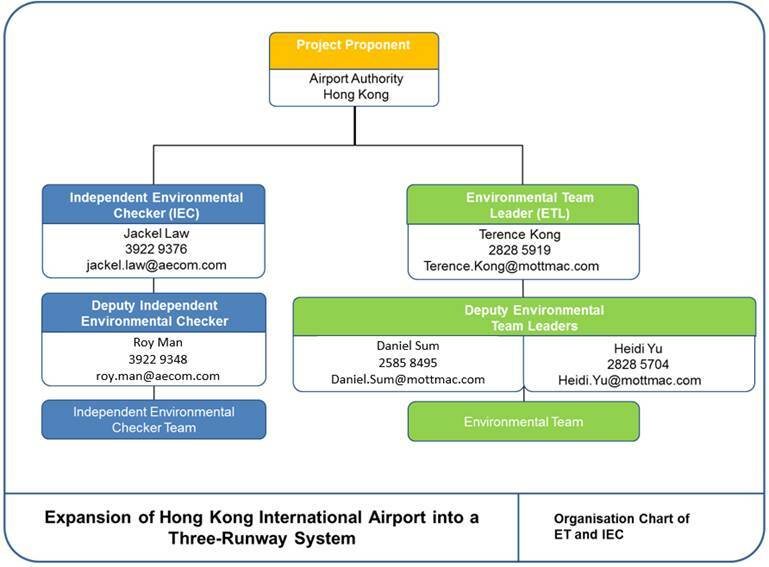 Attachment II presents an organization chart of the ET (together with that for the IEC, as described in Section 4 below) required under EP Condition 2.4. 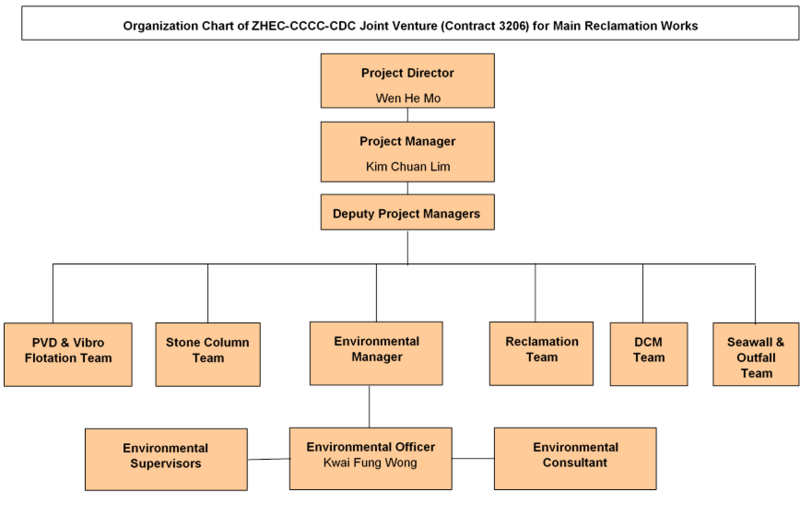 Attachment II presents an organization chart of the IEC required under EP Condition 2.4.